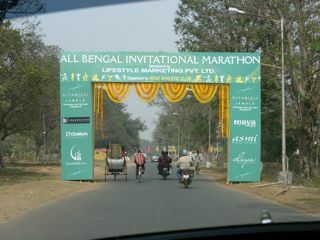 This time, in my hometown Durgapur, there was a Marathon Run that was organized by a local club. I was mildly surprised since running – let alone marathon – is not that popular in India in general, my sleepy hometown in particular. Nevertheless, I decided to participate (I was already running 10 km everyday after I landed for vacation). First let me point out that you should not get fooled by the naming. While called “marathon”, it was really a half-marathon – 21 kms. For the uninitiated, “Bengal” refers to the state that we are from. When I arrived at the running place, there were a lot of surprises in store for me. First, unlike here in USA, when they said they will start at 8 AM, they were merely saying that somewhere around that time we will get started. When I enquired, they said they are waiting for the VIP to arrive. Some minister came and started the run – so we had to wait for an hour for him. It was also a lot of fun watching these kids pushing each other to get their feet on the chalk-mark of starting line. Nobody wanted to stand behind anybody. Everybody wanted to be the first to get started. As if over a stretch of 21 km, starting a foot behind, would unduly pose an insurmountable gap that they could not cover. Most of these kids also bowed out by the 8 km marker. (Out of about 350 participants, 72 or so completed). The real attraction for everybody was to get an award from Sourav Ganguly. India is a cricket crazy country. One of their most successful captains – now retired Sourav Ganguly – hails from Bengal. Bengalis of all age and groups are absolutely nuts about Sourav. He cannot do anything wrong in their eyes. Every failure of his was due to a bigger conspiracy somewhere else. Bengalis usually forget their otherwise lacklustre performance as a state in almost every aspect of life by just bringing up Sourav in any conversation. (btw, before Sourav it was the Nobel prize won by Rabindranath Tagore 🙂 ) That said, Sourav was indeed a very fine cricketer and a very successful captain. 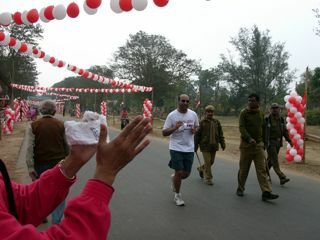 Nonetheless, I did finish the race – nowhere close to getting recognized by Sourav though!! I finished at 2 hour 3 minutes. While that was my career best half marathon, the winner was a 20 year old marathon runner from North Bengal who finished it at 1 hour 11 minutes!!! I was impressed. This year I am determined to increase my speed. In case you are wondering what the security guys were doing around me, they had come there for Sourav Ganguly! !